Gumti Hydroelectric Power Project is located at Thirthmukh, Tripura, India . The Gumti hydel project was commissioned in 1974, despite fierce protests by nearly 40,000 indigenous tribes people whose fertile lands went under water. Not even one-fifth of the people who were forced to give up their land were compensated because most tribesmen had no land records to prove ownership . Also, during 1970’s rehabilitation policy was not in place, nor land records by the original land holders available. As a result many land less youths become insurgents and perhaps the problems of militancy of Tripura has gained ground. 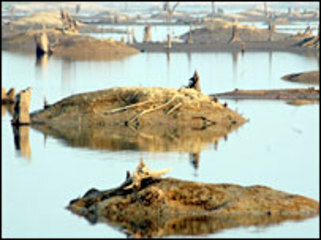 In 2007, the water level of the dam had fallen tremendously and the land masses emerged from the earlier submerged land. The land losers gather on the emerging land and wanted their original land back. However, they had been chased away by the state police force . Still today, there is a strong demand from the tribal people to the state government to return their land. The project is not generating power right now, because of low water level and heavy silting of soil on the catchment areas. The government’s stand is that it will not return the land because hydel power is still cheaper than other form of power generation and it does not want to scrap the project . On the contrary, the government has formed a committee to conduct a feasibility study to revive the dam . Over the years, the conflict has also brought about a high rate of deforestation, due to agricultural practices of the displaced people in the surrounding hills. There's also rampant illegal logging by timber smugglers. That's badly affected rainfall levels and led to heavy silting in the Gumti reservoir. Local people and advocacy groups call this an historical injustice against the tribal communities of Tripura. However, it seems very unlikely the dam project will be scrapped. The northeast of India is in fact becoming the hydropower region of the entire country. Other Tribal who lost their lands due to the project become landless and unemployed. It has fulled violent insurgency with young men and women from landless families joining the state's two major rebel groups . Why? Explain briefly. Very few people were compensated in 1970’s because most tribesmen had no land records to prove their ownership at that time. It was an injustice to the indigenous people of Tripura. The tribal are marginalized (now their number is less than 30 percent) in their own land by the perpetual inflow of Bengali settlers from Bangladesh .